Food terrible wasn't cooked flies landing on the salad and fruit live caterpillar in my mum's salad . Chicken had blood running out of it . Food was cold don't cater for food allergies staff very rude hotel rooms dated . All inclusive should mean all drinks are free but only certain drinks were free and the bar shut at 11pm. Ice creams only available between 4pm & 5pm ridiculous when you are all inclusive . Hotel tip: Don't be fooled by the hotel being 4* and don't go all inclusive. Had a lovely holiday at the Kentia but a week of mixed feelings. As noted in previous reviews standard of accomodation is excellent, with a warm and friendly atmosphere. 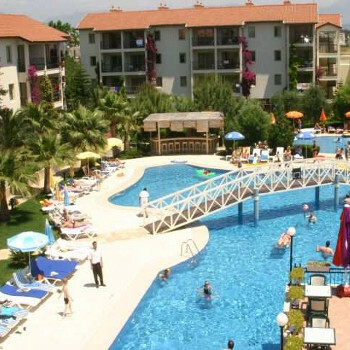 Decor modern and comfortable with few nice touches of Turkish style, gardens well kept and pool area spotlessly clean. Restaurant and bar staff fantastic providing basic but good quality food with superb customer service. Entertainment was good fun. On down side (& it makes me sad to write this but feel people should know) a lot of people including ourselves experienced overbooking and were asked to change rooms during their stay. Upon arrival we were told we would be recieving one apartment for four adults rather than the more expensive two studios we had booked. Every day 3/4 room numbers were called out over pool tanoy and told to go to reception- 2 days before we were due to leave our number was called out, we were told that we HAD to move rooms! Unecessesary hassel. This playing around with rooms is probably to make sure rooms are earning money every single hour however as a rehearsed traveller I have never experienced this before and it struck me as rather unprofessional and greedy. From grumbles around the pool it was obviously not just us it annoyed and experience would make me nervous about returning to Kentia again. Maids came every day so pretty clean. Towels changed once a week. Floors only swept (bizarrely only hallway and not kitchen area with crumbs?! ), not mopped all week so black feet after you've had a shower. Perhaps maids have changed since previous reviews? Bit of a battle for the sunbeds going on - don't expect one unless you're up early! Kentia made no attempt to stop people reserving them and going off for hours - felt they should really be removing towels as it's a little unfair as not enough to go around. Loud music played around pool all day, probably not best choice if you like relaxing in peace and quiet. On plus side it created happy holiday atmosphere and music varied catering for all ages and tastes. Beach quite dirty, lots of cigarette ends etc, I'd head for clean beaches of Mallorca or Portugal if I had kids as wouldn't want them playing in rubbish. Just got back from Turkey a few weeks ago. We stayed at Kentia, we found it to be one of the very best we've ever been to. The whole complex was very clean and well maintained. Apartments cleaned most days, clean linen several times during our fortnight. Pool area cleaned by one bloke who seemed to spend all day doing just that,it was spotless. Didnt hear once of any ear infections. The kitchens were similarly spotless, you could see right into them as you walked past. Although we were self catering, we regularly ate at the Kentia, well cooked and prepared and good value too. The only gripe about Kentia is its out of town location. Not a total disadvantage though; you dont have a nearby bar or disco belting out 200 Watts until 04:00 hrs! All staff were friendly and couteous and mostly spoke good English. We would be very happy to go back to Kentia next year.